Definitive proof that Bush lied to the citizenry and Congress, and decided to 'fix the intelligence and facts' to justify war on Iraq. A top-level government memo marked "SECRET AND STRICTLY PERSONAL,"
... dated eight months before Bush sent us into Iraq, following a closed meeting with the President, reads, "Military action was now seen as inevitable. Bush wanted to remove Saddam through military action justified by the conjunction of terrorism and WMD. But the intelligence and facts were being fixed around the policy." 88 members of Congress have signed a letter calling on the Bush administration to respond to reports that the U.S. and Britain had a secret agreement to attack Iraq. 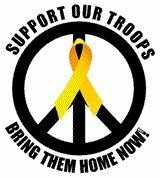 Representative Delahunt agreed on 4/9/05 to sign Lynn Woolsey's HR 35, "plan to begin the immediate withdrawal of troops" from Iraq! If you live in the 10th district of Mass, call and thank Delahunt; if not, urge YOUR representative to sign on! In a stunning blow to the Bush administration, a Navy judge gave Petty Officer 3rd Class Pablo Paredes no jail time for refusing orders to ship out for the Persian Gulf. Paredes: On cross-examination, Navy prosecutor Lt. Jonathan Freeman elicited testimony from me that the US wars in Yugoslavia and Afghanistan also violated the UN Charter, as neither was conducted in self-defense or with the blessing of the Security Council. Upon the conclusion of my testimony, the judge said, "I think that the government has successfully proved that any service member has reasonable cause to believe that the wars in Yugoslavia, Afghanistan and Iraq were illegal."